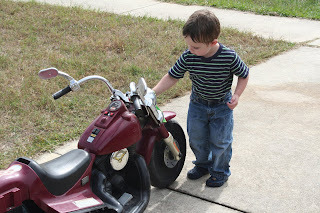 A few weeks ago, we found a PowerWheels Harley on Craigslist for really cheap. It had been quite weathered, but worked very well. Chris thought he could take it apart and repaint the "chrome" parts, etc. 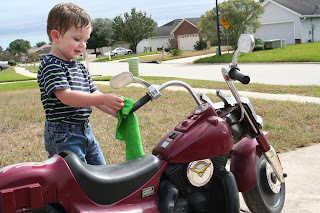 So while Chris was painting the chrome, Grant washed his bike! He's so proud of it (even without the shiny parts!) and has so much fun riding it. He's even mastered the steering - almost! So Grant now has a bike, just like Daddy, and he asks to ride it at least 100 times a day! That's awesome! Josiah would LOVE to have one! 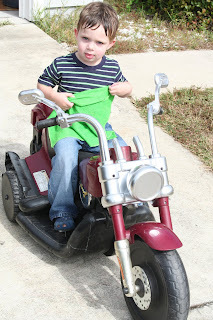 He says that his FP tricycle is his "motorcycle". He even drives around the house with one of Randy's helmets. It's fun to watch them, isn't it? 11.08.08 Such a Big Brother!